The last couple of months, we have found ourselves trading back and forth quite a bit. Just when it seems that bulls or bears have the upper hand, the other fights back. There is supporting data on both sides, which can make things more confusing (however, I personally feel the economic data is much more favorable on the bear side at this time). I wanted to take this time to reach out to all you CMS readers out there who are also active in trading and get your thoughts. 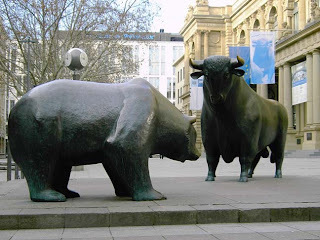 Bull or bear? Why? Leave a comment on this post stating where you think the market is going the next three months and why. Bear, Live in CA and things are getting worse for middle America. BJ and crew will kill this economy and tax it to death ! Schiff is on the right track. I am a long-term bear, but I think the markets will go up with the help of the "invisible hand." bear, im hoping the commercial real estate shoe is really going to drop soon. Bear short term, bull in 2010. I think the market was like a partying college student for the past few years. Everything was fun until one too many drinks was had. Then the market was face first in a toilet bowl. Problem is before the market finished purging itself from all the partying, the government already started feeding it more alcohol! Not a good combination! If anyone that has recovered from a hangover knows- the only cure is a slow recovery with no partying in the near future. Let the market throw up already! I am a tired bear...I really am surprised to see this market remaining so strong. Is it possible that it discounts all the "potential" bad news. I just can't believe it, but then I have been totally wrong on the strength of the recent rally. Bull for sure. I think the worst is done. Done good the last few months ready for the next leg up. Bear for the next 1-2 months. Market is trending down since the second week of June. BEAR. For a long long time. It appears we are puting in the last right shoulder. The charts indicate a left shoulder pair, the head and a right shoulder pair forming. Then its down from there. If S&P can not break 20days average moving line(910), Bear comes again and push market to 850-860 level. Bear. Obama’s Marxist ideology will not save our economy. The only real way to turn the economy and to create jobs is by cutting taxes (for everyone). Plus, the commercial real estate storm is just off shore. I'm an Elliot Wave follower and I think we are in B wave so correction coming soon. Bear for sure until we get past C wave (could mean 600 or lower on the S&P). I am a very tired bear as well. I just don't see how the Fed and the PPT team will let it go... pretty much they have infinite resource to change the trend and pump the market higher. chris writes - the market loves to catch everyone flat footed. all i hear lately is the head and shoulders talk. this market will not hand you a downtrend on a silver platter. my bets are that we trade above the 880, up and down staying below 950. the trend is your friend. be very careful about being bearish or bullish. strong convictions either way can be money losers. stay agile and go with the trend. for now we are still in a holding pattern until we have confirmation either way. don't load up until we get a confirmation in my opinion. It looks like Deflation is OFF THE TABLE now. You gonna be a bear still or bull now ? thanks - i'm neither a bear or a bull. i do my best to trade the market i have, not the market i want. For me personally, I also try to play both sides. However, in a "bear market" going bull is the risky play and vice a versa. I made some great profits back in March going long and unfortunately cashed in much too early. I spend two months on the sideline for the most part for the rest of that rally and have been taking and giving back profits the past month ever since. Technically, this type of market points to sit on the sidelines, but I like to roll the dice sometimes. All in all, for me, It has been a rather strong year, but I could have done without the last three days. It is very important to know when to get out playing bear or bull. greed and fear are the two killers. This is why the D-EYE is so simple and so portable. I requested the patent, now pending, and I joined the company in Italy and together, we went ahead to build the D-EYE.